With the sun beating down hard, the beer rapidly diminishing, and the only roadhouse in hundreds of kilometres fresh out of Maxibon ice-creams, it was safe to say tensions on Race to the Cape were increasing. The Camper crew had already spent a fortnight tackling the tracks from Cairns all the way to the tip of Cape York, with camper trailers (Mars and Cub) in tow, led by our trusty 'Troop Leader' Dan 'the stuntman' Everett. 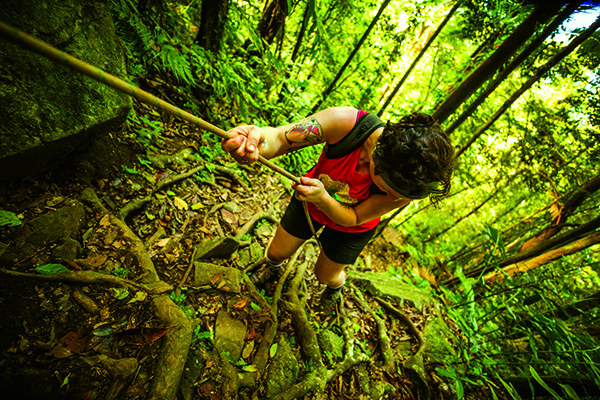 In desperate need of some chill out time, on our way back down south, we pulled the campers into the sites at Cape Tribulation's PK's Jungle Village. We made a beeline for the air-conditioned bar, and jumped in the swimming pool, free from fear of croc mauling. Well, the others did. I headed straight for the shop in search of Maxibons. Preferably the peanut-butter and jam flavour. 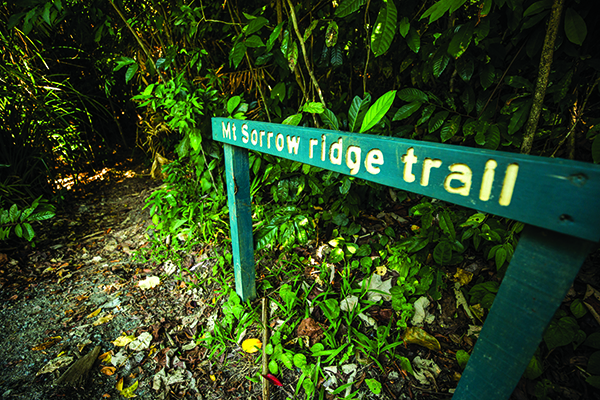 We were there to explore the Daintree Rainforest, and the depressingly named ridge trail of Mt Sorrow was in our sights. A perusal of Queensland's national parks fact sheet warned of leeches, the requirement of exceptional fitness, adequate water supplies, enough daylight and an EPIRB. Naturally, I prepared the hiking kit. Snacks, first-aid kit, space blanket, salt for leech removal and more snacks. However, I got swept up in the devil-may-care attitude of my photographer Jack, and accidentally left the whole kit in my room, aside from the water and one out-of-date protein bar. Oh well, I thought. All the more reason to make sure we knock this hike over in enough time. I needn't have worried. We ended up tagging along with a few of the backpackers who worked at our lodgings, including perky American Amber who'd already done the hike twice before. She failed to tell us that she was going for a personal best time, and held a cracking pace to rival Usain Bolt. I knew within the first hundred metres I had nothing – and everything – to fear. We'd be back for Happy Hour, that was for sure. After a raucous evening establishing ourselves as 'the zany writers from down south' and toasting drinks to new friendships, we woke surprisingly chipper and ready to bust a move up the mountain. Against our better judgement we shunned simple cereal and toast, opting for bacon and eggs, a rash call we would both regret at the two kilometre mark. We then hightailed it over to Amber and co who almost left without us as they assumed we'd be convalescing from the previous night's shenanigans. We scoffed. Celebratory beverages or not, we were securing a mountain view today! We set off, a crew of five – confident Amber; British Jess, who voiced concerns about the activity level ahead of us, American Leah, who was celebrating her birthday, bearded Jack, certain that I had overstated the difficulty of the task ahead, and me, characteristically sweaty before we even left the PK's car park. The actual trail entrance was 20 minutes walk up the road and the sun was high by the time we arrived. With a quick glance at the warnings signposted at the entrance we set off. I consider myself to be reasonably fit, so the early protests of my heart rate proved we were in for a steep climb. 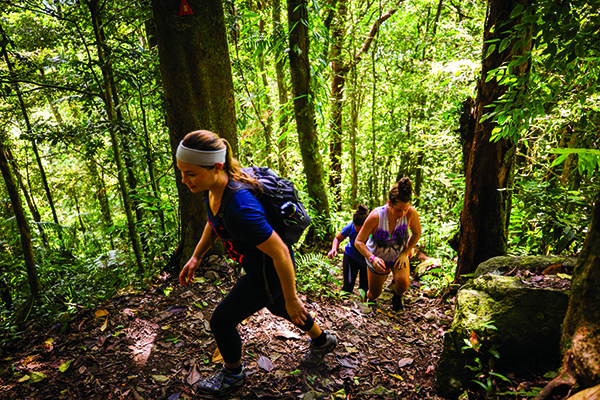 Steep is an understatement, but it's not the only factor that makes this a difficult hike. The path is extremely narrow, and often obstructed by fallen trees. There's roots aplenty underfoot, and with the foliage and hanging vines you'll be doing more ducking and weaving than Mike Tyson at the height of his career. Speaking of vines, the ones on this trail are of the 'wait-a-while' variety. They hang from the rainforest canopy and may look harmless, but once they've attached to you and you try to walk off, you'll realise they're harder to ditch than drunken Barry from finance at the work Christmas party. Just stop, and slowly walk backwards which should unhook their razor-sharp spikes from your skin and clothes. As for Barry, tell him the DJ's playing Footloose and you just can't miss it. Just when you think the undulating track can't get much harder, you'll encounter a rugged section which has a rope that is necessary to haul yourself up. I was relieved to have a helping hand here, and found it to be one of the more enjoyable parts. Less enjoyable were the leeches that hopped on most of us for an easy ride to the top, mostly as the vegetation became wetter as we ascended. The thirsty little bloodsuckers were hard to get off, but to be honest, I was surprised we didn't encounter more. While the leeches didn't disrupt our fun, the snake I narrowly avoided stepping on almost did. It was too quick for me to identify it, but there are plenty of venomous snakes in this area, although as long as you use common sense you should be fine. 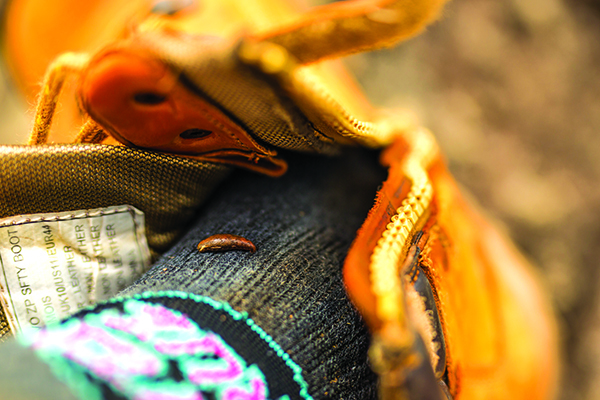 Wear hiking boots, long socks or pants, and give them a wide berth. I'm not sure if the shirtless and barefoot German guy with the furry bear rave beanie we passed subscribed to my brand of caution, but we didn't find him collapsed and frothing at the mouth, so I'm sure he was fine. This is a hard trail, so make regular stops for water and to take in the beauty all around you. Butterflies, birds, creepy crawlies, and interesting foliage abound, and it would be a shame to miss out on the sights because you're doubled over catching your breath. Or because you're hot stepping it, trying to keep up with your unofficial hike leader who's at sprint pace. When you do finally get to the lookout at the top (680m elevation), you'll find it's an extremely small fenced off platform. When we got there about two and a half hours after we began the hike, we were treated to a view that was made up entirely of clouds, or what I imagine it's like being inside a giant marshmallow. Determined to get the scenic view we had pushed ourselves so far for, we jumped the lookout barrier and hiked on another 200m or so over a narrow ridge that tested my fear of heights, to a comfortable little ledge of rocks. The cloud was still heavy so we sat and waited. After about 20 minutes, it cleared and it was everything I had hoped for. 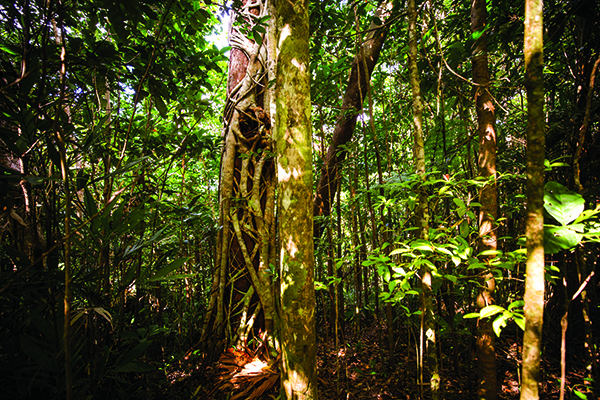 The Reef, vast and blue touched the rainforest, lush and green. 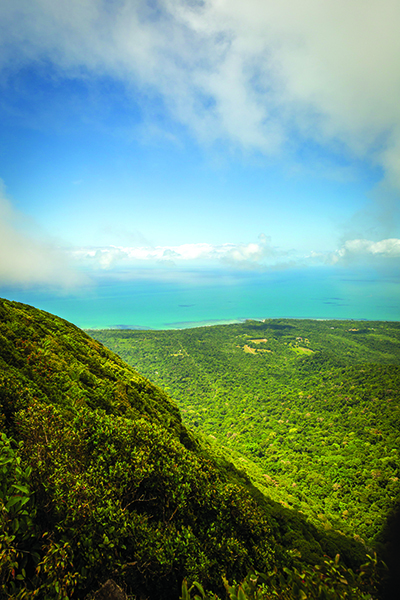 The Daintree coastline and Snapper Island were in view, along with the shadows of coral reef. So high above the difficulty we had encountered below, the relaxation was welcome and the sense of achievement satisfying. I nibbled my out-of-date protein bar and tried to commit the view to memory as I mentally prepared myself for the descent. What goes up, must come down, and here's a tip for you – climbing down Mt Sorrow is just as taxing as the way up. By the time we reached the road I was ready to hitchhike back to PK's, my legs were so exhausted. If you love a challenge and feeling like you've achieved something, this Sorrow is worth suffering. 36km to the Kulki day use area. 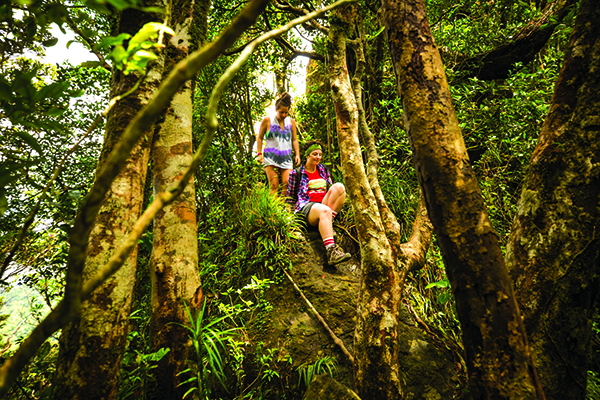 The ridge trail is only seven kilometres, just over three kilometres to the lookout at the top. It's a 680m climb, and the steepness and humidity will test you. There are trail markers at every kilometre, however you need to stay alert as the foliage is thick and it's easy to take a wrong turn.